I have never personally witnessed basketball fans storming the court, but I have witnessed eager painters storm the community room. . . just this past weekend in fact. Saturday and Sunday, certified Bob Ross instructors, T.R. 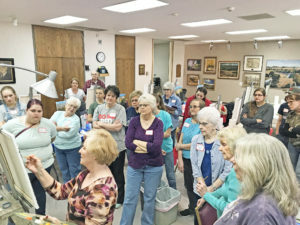 Mathews and Sandy Seamone, held Joy of Painting classes in the Hansen Museum’s Community Room. Both days, right around 8:40 a.m., excited painters rushed in to claim their easels. Michelle Shannon, Debra Grammon, A.J. 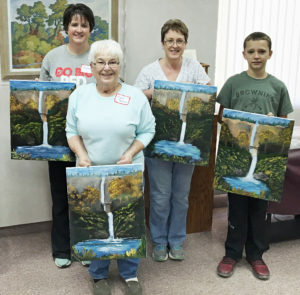 Grammon, & Carol Tallent – 4 Generations of Painters! Joy of Painting class is a great place to experience painting for the first time; they provide the painting supplies (no huge initial investment in equipment) and lead you step-by-step in completing a painting. Uploaded to the Dane G. Hansen Museum’s Facebook page are some great photos from these classes. Take a look, you might want to come paint with T.R. and Sandy when they return in June. Talent is not transferrable via osmosis. Talent must be cultivated. Even gifted individuals or those endowed with raw talent must take intentional steps toward developing it, or their talent stagnates. 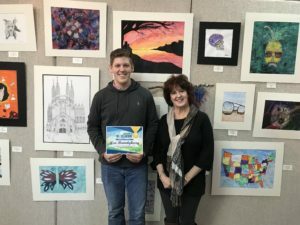 In the 41st Annual High School Art Show, our current exhibit, many talented young artists have chosen to place themselves under the tutelage of qualified instructors to further their artistic skill sets. These High School Art instructors are the real force behind our Annual High School Art Show. If they did not write the show into their curriculum and take the time to get their students ready, this show would not happen. Thanks to the instructors for going the extra mile to provide their students with the experience of hanging art in a professional gallery. We appreciate and applaud your efforts! Gerald Sigl, February’s Artist of the Month, came last week to replenish his display. Gerald’s leather goods are high quality and extremely reasonably priced. Need a birthday or anniversary gift? Come look at Gerald’s display. He has some great gifts for men and women. Gerald’s display will be up through the month of February. The Museum is located at 110 W. Main Street, Logan, Kansas. Museum hours are Monday through Friday 9-12 & 1-4; Saturday 9-12 & 1-5; Sunday & holidays 1-5. We are handicapped accessible and thanks to the generosity of the Dane G. Hansen Foundation, there is never an admission fee. For more information, please call 785-689-4846. We hope to see you at the Museum!